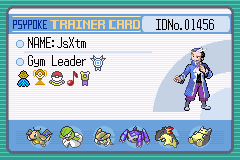 I am starting a Pokemon game team. My friend Devon have started SevereInc., and we need some new faces to help start our own Pokemon franchise. We need the following positions to be filled (2 of each): Character and Story Designer, Spriter, and Game Developer. I recommend either previous game making experience or an extreme liking of the Pokemon series, apply in the comments. I'll make a great story 4 your franchise. And yes I'm in. I'm 18 and have a Twitter account. My email is: bokymmufaza-8495@yopmail.com. I've been playing since Yellow Version and my favorite type is Fire and I like Cyndaquil as my starter. Um... yeah. If you're making an actual company to write a game, it can't be "Pokemon". It's copyrighted and Gamefreak/Nintendo will sue your pants off. It can certainly be "pokemon-like" (see all the games in the app store that are loose ripoffs), but not "Pokemon".